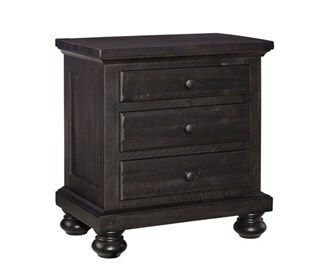 The Ashley Sharlowe Three Drawer Night Stand with its savory dark charcoal finish, the Sharlowe nightstand offers a more sultry take on cottage-chic inspiration. Showcasing saw marks and natural distressing, the solid pine wood is all the more richly rustic with plank styling for homey charm. Elements including English dovetail craftsmanship and a felt-lined top drawer reflect Sharlowe's quality and attention to detail.